COmment NetApp announced compaction as an extra form of data reduction in ONTAP v9.0. What is it? Compaction applies to NetApp’s all-flash FAS arrays. A blog post by Adam Bergh, data centre practise lead at Presidio, explains that multiple IOs can be written more efficiently, from a WAFL space point of view, if they are stored in a 4KB block. This block size is the one WAFL (ONTAP’s Write Anywhere File Layout) uses when it writes to disk. Avoiding unused space in such 4KB blocks is a good idea. 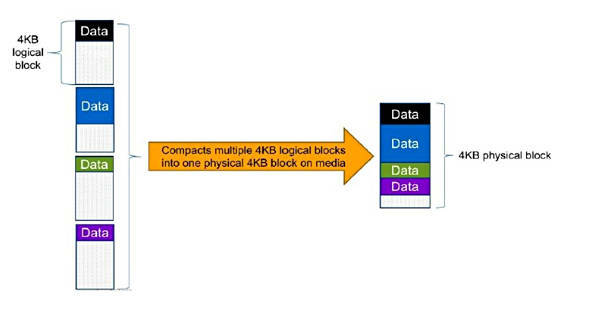 The aggregation of multiple IOs into a 4GB block takes place with 4KB logical blocks as they are being organised before being written to disk. Each IO is put in a 4KB logical block, even if it is less than 4KB in size. With compaction, multiple IOs are added to a 4KB logical block until it is full and then a fresh logical block is used for the next IOs. Compaction works separately from deduplication and compression and so is additive to them. Bergh looks at several other features in ONTAP 9. One is enhanced analytics. This will work with the forthcoming OnCommand Performance Manager 3.0, and will have a head-room metric. Storage admins can find out how much an ONTAP cluster mode is being utilised and, from that, enable a view into how much additional workload the node can handle.